Bologna is beloved for various reasons, some of its most obvious attributes fall under the three categories or nicknames that have been given to the city that any Bolognese can recite by heart; la dotta, la rossa, la grassa. Meaning Bologna is the learned, the red and the fat. Nicknames that clearly come from some of Bologna's most famous characteristics, the learned originates from Bologna being the esteemed birthplace of Europe's first college in 1088, Universita di Bologna, Alma Mater Studiorum. Bologna was given the title the red most obviously because of the bright colored terracotta roofs and red painted walls that give the city a bright hue of red and secondarily name the red because of it's historic connotation as being politically far left. And finally, the fat - I'm sure you can all guess why Bologna is named that? You're right, it might have something to do with being the food capital of Italy, being the home of mortadella, prosciutto, tortellini, and many other famous Italian delicacies. While these three Bolognese characteristics help solidify Bologna as one of the greatest Italian cities, Bologna is also home to many other treasures that often get overshadowed by "La Dotta, La Rossa e La Grassa". When you have limited time in Bologna, it only makes sense to run from Enoteca to Osteria to Pasticceria to Gelateria while fitting in some churches, the university and views of the red roof tops. But if you look all around you and really soak in your Bolognese surroundings in between your last bite of lasagna and your first lick of gelato, Bologna will transform into something else completely! If you're strolling though the streets of Bologna on a Thursday afternoon*, late at night or during a closing for pausa you may notice that there is a whole lot of crafty art on various store fronts. 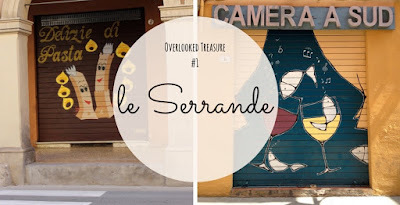 Many stores have artfully painted or grafiti-ed, if you will, their metal store front shutters (also known as serrande) that they use when shop is closed. One could spend days walking the streets looking at the various designs and illustrations on the doors. It's not quite determined why so many stores actually commission these pieces of artwork on their storefronts, but many believe they are painted to deter vandalization. 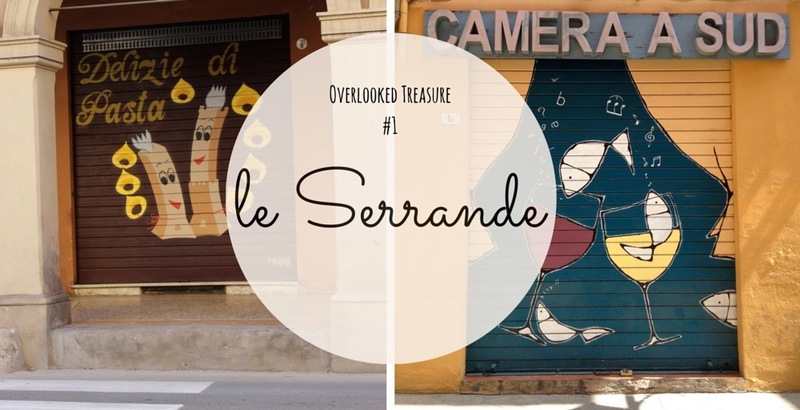 So keep your eyes peeled and pick your favorite design when strolling the Bolognese streets! *Why Thursday Afternoon? Few tourists know that Thursday is Bologna's day of weekly closure for many stores! This may just be a treasure to those who are used to seeing oversized American mailboxes with little intrigue, but the mailboxes built into the sides of medieval buildings with intricate crests and Italian engravings are not to be over looked. These are not extremely common in Bologna so keep your eyes peeled. 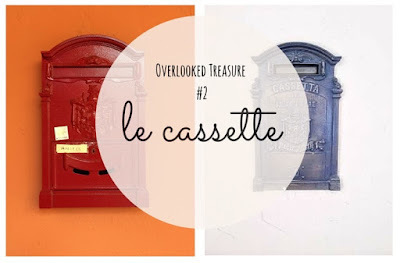 You'll find that stealing a quick glimpse at the iron work and reading the word Cassetta can make your day. 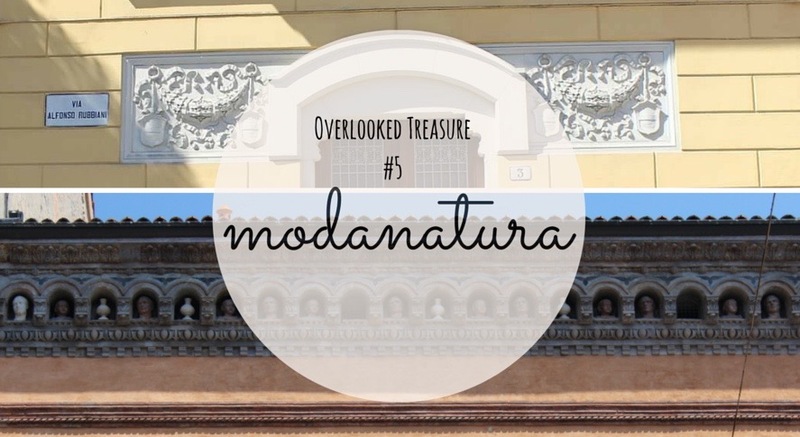 Depending on your height, this third overlooked treasure may be easier or harder to overlook. Door knockers in Bologna have some insane street appeal. 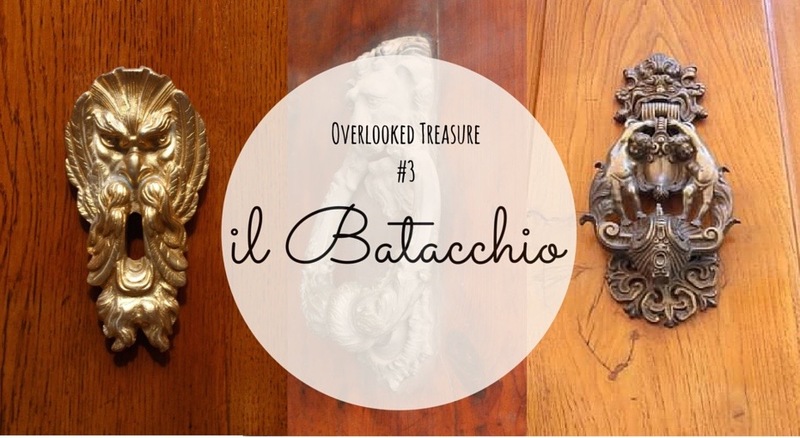 With the grandness of some entry ways and doors opening up the grand Bolognese palazzi, you might find yourself staring at some pretty intense artwork adorning the key holes or taking place of a doorbell. Door knockers in Bologna are intricate and entertaining and there are a multitude of varieties to be found, so keep your eyes trained on the doors as you walk the porticos of Bologna. 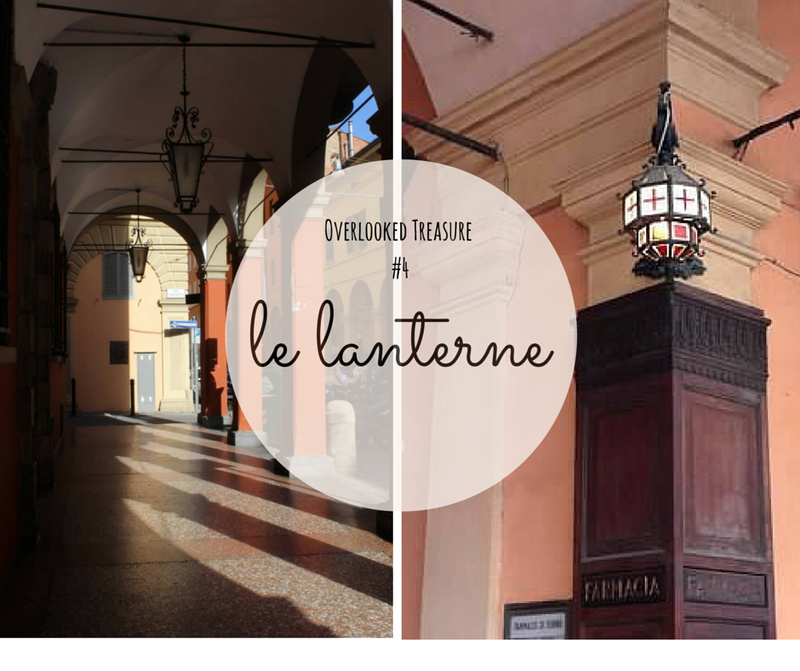 Lanterns light up every portico of Bologna and they aren't just your normal street lamps. Massive, intricate iron lanterns hang from the ceilings providing light and a little piece of art to admire. While the lanterns that line the porticos are beautiful, you might find some really extraordinary and unique lanterns at various street corners, like the one pictured above by the farmacia. These are the real street treat! 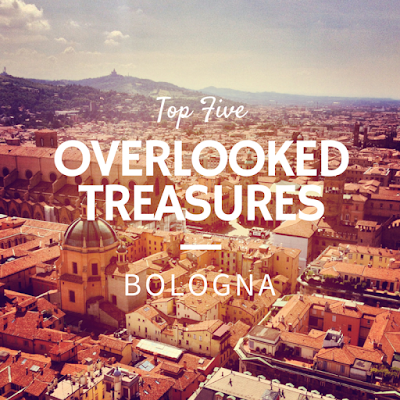 If you have a bad neck, refrain from seeking out the fifth overlooked treasure of Bologna. Many of Bologna's palazzi have very intricate moldings a stone work throughout their facades. When you find an even walking surface, don't be afraid to look up and scan the sides of buildings, they won't disappoint. And if you find yourself in Piazza delle Sette Chiese or Santo Stefano, make sure you let your eyes wander here! As you arrive in the piazza the facades above the porticos are topped with beautifully adorned heads. Not to miss!